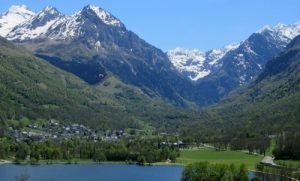 Our adventure holidays are based in the central French Pyrenees. Here, we are blessed with a great combination of the Atlantic and Mediterranean weather systems. To the western end of the Chain, the Atlantic weather systems prevail and rainfall is high. Indeed, the Basque country in the very far SW corner of France is known as being one of the wettest areas in the country. As you move east along the Chain, the rain levels fall and the weather becomes drier and sunnier. 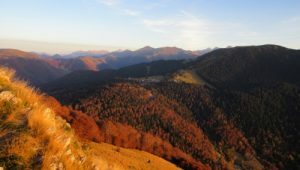 The seasons are not as clearly defined in the Pyrenees as they may be elsewhere which is probably due to the geographical nature of the Chain. It’s not uncommon to get summer-like days in late autumn with temperatures into the mid 20s. 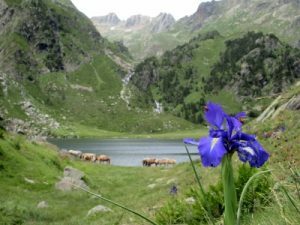 So what’s a typical spring in the Pyrenees? The answer is quite simply that there is no ‘typical’ in the springtime. In some years such as in 2017, it is dry for weeks on end with temperatures into the low 30s C.
In other years the Pyrenees experience a wet, cool spring with a good amount of rainfall. Regardless of the amount of rain, the rivers are swollen with snowmelt in the springtime which makes this time of year simply perfect for river sports such as rafting, kayaking, river boarding and canyoning. 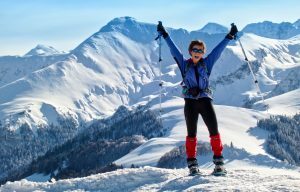 April and May are also excellent times of year for ski touring with ‘spring snow’ making for some interesting outings in the high mountains. Summer is the time of year for hiking in the mountains, for horse trekking, rock climbing and road and mountain biking. But this is SW France and temperatures can climb into the mid and even high 30s in July and August and sometimes also into September. This is usually the case when the weather systems come from North Africa which they are wont to do from time to time. Fortunately the foothills and mountains of the Pyrenees are generally spared this sometimes stifling heat that can hit the flatlands. Evening thunder storms are a regular feature of the mountain environment but you are most likely to wake up to a cloudless sky in the morning. Autumn is many people’s favourite time of year in the Pyrenees. This is the time of year especially for road and mountain biking, for hiking in the high mountains and for mountain running. Long spells of stable sunny weather and temperatures into the high 20s are not uncommon. The summer crowds have gone and the roads are quieter, not that they are ever particularly busy anyway! The autumn colours in the mountains are nothing short of spectacular as the bracken dies back and the bilberry and heather foliage takes on magnificent hues. The hillsides of the central Pyrenees are covered with deciduous woodland which are simply stunning as the seasons change. Winter in the Pyrenees is the season not only for skiing but for so many other snow-based activities. The non-skier has the opportunity to get high into the mountain environment on snowshoes. Then there’s cross country skiing and numerous other activities such as snake sledging, airboarding and riding with huskies that families will enjoy on custom multi activity holidays, . In winter in the Pyrenees, snow may fall down to 700m alt in an average year. In the high mountains above 1800m alt, a quantity of 1m and 4m of snow may accumulate. The higher ski resorts are generally open by Christmas with the lower altitude resorts such as Guzet in the Ariege and le Mourtis in the Haute Garonne opening in early January. Again, long spells of crisp, clear weather are not uncommon in winter. Whatever the season, the foothills and mountains of the Pyrenees have an unspoilt and breathtaking beauty all of their own. They offer an unrivalled scope for off the beaten track adventures which are just waiting to be discovered.